DJs have the gift of recognizing what the crowd wants to keep the party going and they can play the right song to suit the mood or the occasion. A good DJ needs to be skilled and to know about music but there is another important aspect that is crucial for their success and that is their equipment. If you take music seriously, you can’t settle down for standard consumer equipment and one of the crucial devices for a DJ are headphones. Finding the right headphones can be challenging but there are a few things that you can take into consideration to make the right choice. The first thing to think about is your budget. Knowing how much you are willing to spend will help you to narrow down the options. While there are many good and affordable headphones, some of the best devices can cost a little fortune. In the end, it depends on how much you can invest. Deciding which is the best style will depend on your preferences but in general, over-the-ear designs are the most popular option as they can isolate external sound, allowing you to focus on your mix. The majority of models that have earned recognition for their overall quality, have a closed-back or over-the-ear design. 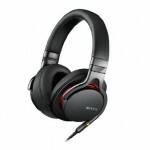 You also need to look for headphones that feature a swiveling ear cup function that will enable you to isolate an ear. Foldable headphones are also more practical for travelling. Accessories like a carrying case, additional cups and adapters or features like an interchangeable cable are other aspects that you may want to consider. It is also important to check the specs as they can determine the performance of the headphones. If possible, it would be advisable to look for a headphone amplifier to enhance the power of the device. For some people, the look and color of the headphones is also decisive. 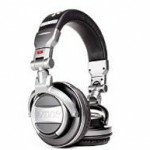 Once you know the main aspects that should be considered when looking for the best headphones for DJs, you are ready to start the search. To help you to narrow-down the selection, we have listed the most complete options available. 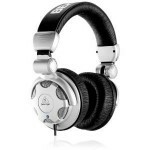 While they are not exactly budget-friendly, these headphones are the best quality devices for professional DJs. The XONE XD2-53 deserve a place in the list of the best DJ headphones that you can find in the market nowadays thanks to their overall quality. They come supported by the reliability of Allen & Heath, a manufacturer that has earned the trust of professional DJs across the world. These headphones are built to last and they can be folded easily, which is one of the things that you need for maximum convenience. The cable can be detached so you can replace it with a longer or shorter option according to your needs. 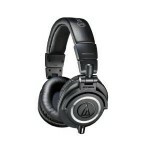 Other features include impedance of 36 Ohms, 53 mm drivers , 105 DB sensitivity and frequency range that goes from 5 to 33 Hz. The earpiece rotates and a practical carrying pouch is included. You can get them for around $200. This model from Pioneer has become an essential for DJs and it meets all the criteria to be considered by many as the best option available. This leather-made unit offers comfortable design and the big 50 mm dome drivers, combined with 36 Ohms impedance support great performance. Replaceable cables, carrying pouch and ear pads are included and the cups can be adjusted easily. The frequency ranges between 5 Hz to 30 Hz and its lightweight design ensures that you can bring these Pioneer headphones wherever you go. Another advantage is that they are durable and you can replace the earpads and cable if needed. Overall, the features and performance of the HDJ-2000-K makes them the best choice for DJing. You can get these sleek headphones from around $220. 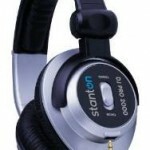 These versatile headphones have become a popular option and most of the reviews about them are highly positive. While they are more suitable for audio engineers and studio use, DJs will also be satisfied with the quality and solid features that the ATH-M50x offer. The leather padding and headband make these headphones incredibly comfortable and the 90 degrees swiveling earcups support easy, one-ear use. The detachable cable is another practical feature and the headphones can be folded for convenience. They also come with a carrying bag and you can get them for around $167. 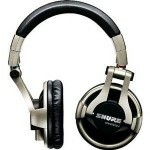 Shure is a name that is trusted by DJs and professional musicians and the SRH750DJ headphones are a solid example of the quality that you can expect from this manufacturer. They feature replaceable ear cup pads, which is a practical solution that allows you to prolong the life of your investment. It means that if there is any issue with the ear pads, you won’t need to get new headphones as you can simply replace the faulty part instead. A convenient carrying bag is included and at $150, these headphones also offer good value for money. These stylish headphones are known for their solid build and advanced features. They are designed to last and to provide the most comfortable experience. With an impedance of 80 Ohms, the DT-1350 stands as the most powerful option in the list and if you pair them with a headphone amp or audio interface, you can get their full potential. The ear cups swiveling and the flexible headband provide the perfect adjustment and fit. Beyerdynamic is one of the most reputable brands available and these headphones provide great sound quality. You can get the from around $180. Finding these headphones can be challenging but if you do come across the K181-DJ, you’ll be treated to a great combination of quality and affordability. They are currently available for just $110, which is a bargain considering the solid features that these headphones support. The headphones also feature 50 mm drivers and a detachable cable. The lightweight design and the folding mechanism make them convenient for travelling. They also offer a comfortable fit and a sleek design. Most top quality options cost over $100, but there is one model that combines affordability with the features needed by DJs. The Numark Red Wave are budget-friendly headphones that offer ear cups swivel, detachable cable and 50 mm drivers, which is remarkable for their price. They are available for less than $60 and while you can experience some discomfort with the leather padding if you sweat, it won’t cause any issues even after long periods of use. They are a practical option that allows you to save money, while enjoying good quality and performance that matches more expensive options. 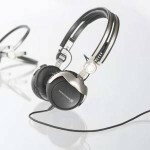 These headphones have earned recognition thanks to their association to some of the most popular names in the industry. The ear cups rotate and the cord can be detached. The Pro 2000 feature 50 mm and they come with a mini-jack adapter and a practical carrying pouch for travelling. 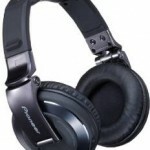 They provide all the features that you need from DJ headphones for under $100 at just $90, they are another affordable option. These headphones are durable and have an appealing design. If price is the most important aspect for you, the HPX2000 is the right option. It is possible to find these headphones for less than $20. They offer the basic features that DJs may be looking for including cups that rotate and a comfortable headband that can be adjusted. 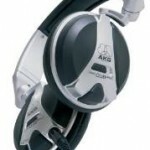 However, they are more suitable for every day use as they are not as powerful and complete as the high-end models. Still, they are a good alternative that provides good quality sound and ultra-dynamic range. Sony needs no introduction and while the MDR1A is one of the most comprehensive options you can get, it is also one of the most expensive models in the list. Although the 40 mm drivers may seem disappointing compared to other headphones, the truth is that the size doesn’t necessarily determine the quality level. These headphones work well for DJing but also for everyday use and the carrying pouch allows you to bring them along wherever you go. The main downside is the price as they are available for nearly $300, which would put off many users.